Calling all my fellow merbabes out from the transfixing tides! As always Motel Rocks have fulfilled the most mythical of mermaid fantasies with yet another stunning gem; this Motel Finn Dress in Aquatic Disc sequin had me safely to shore and chasing the most minty mojito. Much as I love the pink version of this dress, I can safely say that this aquamarine dream is the total equivalent of glittering gemstones crossed with sassy scales and it doesn't get better than DAT. 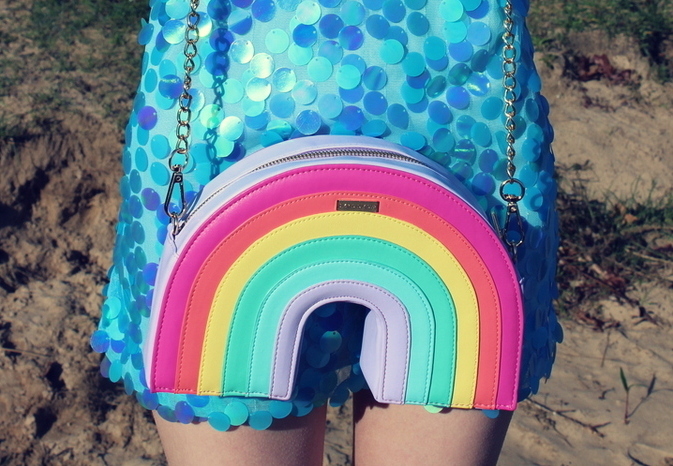 As for the Skinnydip London rainbow cross body bag; what a slice of cloud nine. 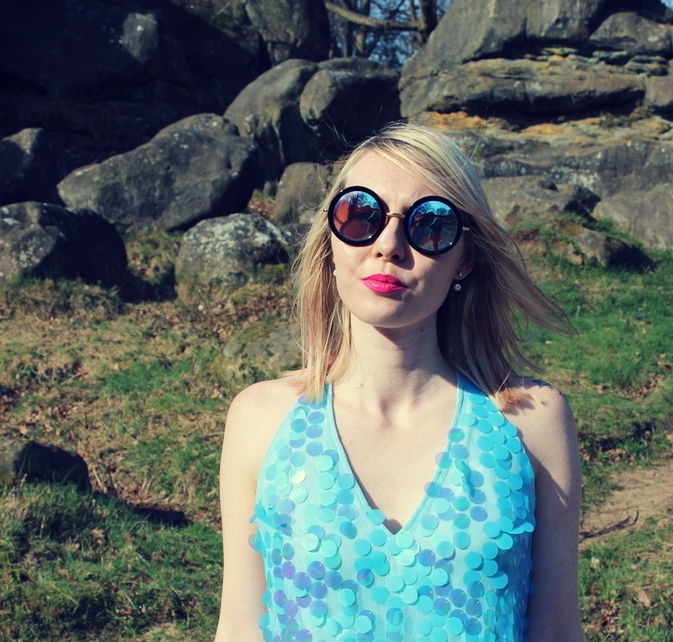 You've seen it before in this previous sugary sweet ootd post. My new fashion icon has to be Graham's sweet niece Alice, the other day we asked her what she loved. Her reply? "Unicorns and rainbows and mingos and glitter". MY KIND OF GURL!!!! Just when you think she can't get more adorable, she also calls flamingos 'mingos' which I'm totally stealing and scribbling down. One for the dreamy dictionary, right?! The sunshine scorched when we shot this look, fortunately it was a lot hotter than it has been these past few weeks (sort it out weatherman, we're all waiting here). The cute kitty that has shown up for this previous merbabe shoot and this glitter infused shoot once again arrived as we were in the midst of taking these photos (will deffo post some photos on Twitter of him, he's an angel). He must enjoy mermaid/glittery sightings. So i'm celebrating my blog's fourth birthday this Friday! Four years of blogging, woah. Sometimes I find it hard to believe that I'm the same girl who could barely look in a mirror because of low self esteem. I never used to let myself wear dresses or skirts because of a lack of confidence, and it was only when I started dating Graham that I actually felt gorgeous for the first time in my (19) years. Talking of confidence, I have to mention my diamond hairdresser, Rosie, who helped me build long-lasting confidence and made me blonde (will forever be thankful to her for that). She really boosted me up in so many ways and in a future post I'll be opening up fully about gaining confidence and smashing down all my self-esteem. If you'd have told my 19 year old self that I'd be running my own fashion blog and posing in public for photos like these (wearing a dress like this) I never would have believed you. And that's what's amazing about life; we never know what we're capable of until we go ahead and slay. Despite a rollercoaster rush of confidence all those years ago, it's only these past few years that I feel like I've grown into myself. Finally after finding the blogosphere and writing my first novel, I feel like I'm on the right path. Both blogging and writing have transformed my life completely. Only two days ago I was talking to Graham, telling him how he really gave me the courage and freedom to not only love myself, but to unlock the courage to my dreams and destines, and discover what my true calling really is. People that really believe in you to the moon and back are where it's at, for damn sure. One day I hope my book lines the shelves, and it'll be the dedications to the people that have supported me most that I really want to see in print. Knowing I've gone from rock-bottom confidence to finding the courage to post pictures of myself for all to see and steer away from the norm to write a novel and chase my dreams, I reckon my 19 year old self would be pretty pleased. And as it's a celebration and all, I have to say I'm pretty damn proud of myself and the way things are turning out. Thank you all for your continued support, you babes really are the best! Oh very cute style! Congratulations sweetheart! Happy 4 years blogiversary! I'm love with your gorgeous outfit and you look fab as always my lovely! Happy 4 years of blogging! I'm so happy to hear you have found your confidence and hope your book will line the shelves as soon as possible ❤️ Also you look like a mermaid, so pretty! Can't even begin to tell you how proud I am of you Soph. I'll never forget the first time I came across your blog- fell in love with your writing immediately. I know that your book will do amazing, I know how much work you put into it and how big of a dream it is to you (also remember that you promised to give me one of the first copies! :P:P:P). Don't ever forget that you're a star! I am so glad that our paths have crossed, you have no idea how happy I am to have met you. Congratulations again on 4 years of blogging, can't wait to see where the next four years take you!! Love you!!! Congratulations of your blog birthday! Four years of blogging it's really impressive! I love that you're talking about confidence and self-esteem in this post. I'm so glad you've grown into a confident woman, working towards your dreams and making them a reality. In certain ways I feel like I've lost my confidence over the past few years, in terms of meeting new people and making friends because of what my past friends have turned out to be like. I hope that one day I'll find that confidence again. But in the meantime you're gonna continue to make me proud and work towards your dreams and destinies. It'll be the best feeling in the world to see your book in shops. 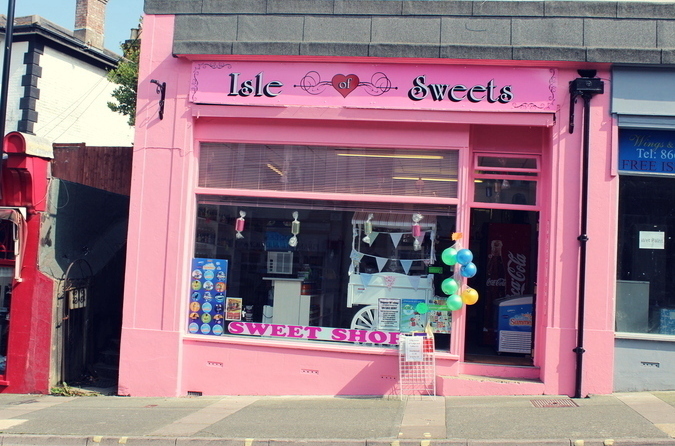 You're also so lucky to have someone like G.
A massive well done on your blogging birthday sweets! 4 years on and your rocking this mermaid themed dress of dreams, which I'm so totally jealous off ha. I can relate to the confidence thing and that blogging has helped me a little too although I don't think I'm fully there yet. Congratulations again and I hope you all the best in your next four years of blogging and in your life!! Go girl, you got this! Congrats on your 4 years of blogging! Like you blogging has boosted my confidence so much. I think it's because I have had the opportunity to express my thoughts and ideas freely. I also loved interacting with many who where so positive that I wasn't afraid to be myself. I can't imagine my life without blogging now. It's such a special community! Anyways, happy I met you through blogging because you are one of those special people. Congrats and to many more years of writing to come. I wish you so much success with your book and future. You are a shinning star already! Congratulations and I adore that bag so much! Congrats.. I can't believe it's been 4 years already!! You've reminded me I've missed my blogs birthday [again] haha!! I absolutely love this outfit! The bag is super cute! And the dress is so colourful and so you! You look beautiful! you look very great sweety! Love every look on you!